It is nearly ten thirty on Monday evening and I am still flying, having left CS at 2:00 Sunday afternoon. CS to Denver to Chicago to Frankfurt to Munich to Cairo. I had no time at all to make a connection in Frankfurt that had left before we arrived. It is a first world airport, most of the time. Except for those times when an airline from a third world country (that would be Egypt in this case) sets up shop. Having missed my lovely Lufthansa flight to Cairo, it was off to Egypt Air, whose motto is (as Dave Barry might say) “No Crashes Since the Last One”. I got to the gate about five minutes before departure to find this situation: there was no plane, half the crew and all of the passengers were locked out of the departure area, nobody was checking anybody in, the clocks were all broken, and one of the Egyptian pilots looked more like Moses than an airline pilot. Long white beard, the whole bit. No robes and staff, but I didn’t know but what they all had to change into robes when they got into the cockpit. Heck, maybe they had to fly towards Mecca at prayer times, so we all wouldn’t have to get up and find east. Plus, as I said, the clocks were all broken. You need to know that when Germany got rid of God a few generations back, for some reason they got really uptight about being on time for things. You know, being pretty precise about things and all, without God to sort of oversee everything, I think they got so they thought the world would fall apart if they were a few minutes late for a train or something. Flash forward to Bahrain. Did I mention that my suitcase didn’t arrive in Cairo? Well, that wouldn’t be strictly true – I arrived at about 2:00 am Tuesday morning, and the bag arrived sometime Tuesday evening. But, the Egyptian authorities wouldn’t let anyone deliver it to me, so I next saw my bag as I was leaving Cairo. It showed up behind the counter as I was checking in, but I couldn’t touch it since it hadn’t been through Customs. Bear in mind that what I didn’t have was underwear, plus socks, clothes, toothbrush, deodorant – the bare essentials of life. What I did have was clothes that I had been wearing for a 31-hour plane trip and two days of conferencing in Cairo. Plus my own personal cloud of smog. So I watched my bag leave again as I took off for Manama, Bahrain, via Dubai. Cairo – I saw the Pyramids. 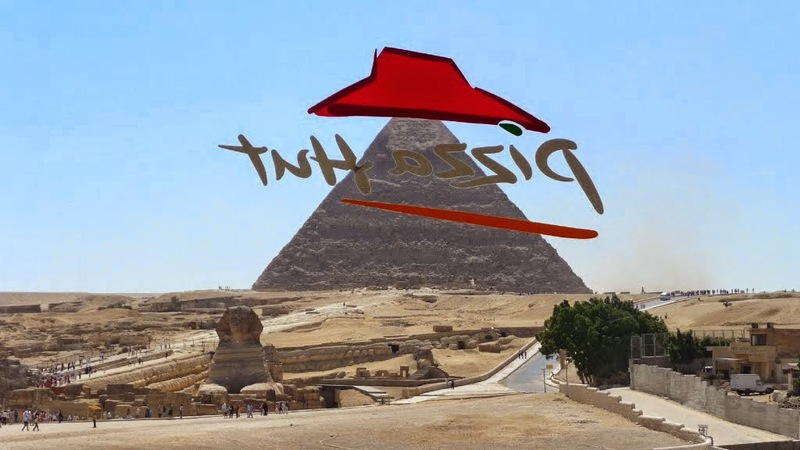 I also saw the Pyramids Pizza Hut right outside the entrance. KFC was next door, I think. Then I went to Bahrain. Did I mention that my suitcase didn’t? It went somewhere else. It’s Wednesday night, and I am wearing the same clothes I put on at home Sunday morning in Colorado. The nice little man promised me it would come on Thursday. I tried to stand close enough to him so that the smell would make him more helpful, but smell is pretty common in this part of the world where many folks wear full body-armor-style robes all day long in 140 degree heat. They make the women wear black. They go with the men to the beach, and the men get to swim, and the women get to sit and watch in the sand, covered completely down to their eyeballs in black. So what I’m saying is, he didn’t notice my body odor, because the main air quality problem they have out here is all from body odor. Thursday I got desperate and bought some clothes. Socks. Underwear. A couple of shirts. Some deodorant. That was key, deodorant. I saw Bahrain. Bahrain could generously be described as flat, hot, and dusty. Sunny, though. Really sunny. All the time. This would be the Sahara desert, I think. An easy job would be weather reporter. I was told that the reason that all the flights leave in the middle of the night is that it is too hot for them to sit outside during the daytime – the fuel might explode. 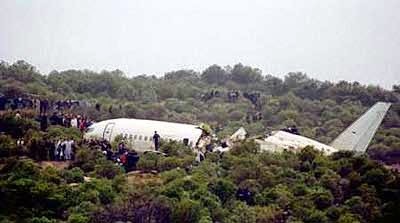 Exploding planes are bad for tourism. Plus the air is too hot for the planes to get any lift on take-off. They'd have to drive through the desert to get anywhere. No lift - not a good thing for a plane. I went to the airport to leave that same day. I arrived at about 1:30 in the morning. Did I mention that my suitcase didn’t? Yes, well, I went back to the airport for a 6:40 p.m. flight, only to find that my bag was scheduled to arrive at (go ahead, guess) 7:00 p.m. You can imagine my joy. The good news was that my flight was delayed two hours, so once again I saw my bag. In fact, this time I got to touch it, if only to roll it from customs downstairs to the check-in desk upstairs. I couldn’t exactly open it or anything, but at least I had felt it with my fingers briefly. I longed for clean jeans with a longing that could only come from five days in the same pair. In Kuwait, my bag arrived. It’s a miracle. I burned my jeans. Wasn’t hard, just threw them out on the pavement and they caught fire almost immediately. It was over 100 again in Kuwait. Kuwait could generously be described as flat, hot, and dusty. Sunny, though. Really sunny. All the time. It has been my favorite place so far, because I got my underwear back in Kuwait. That’ll about do it for Kuwait. 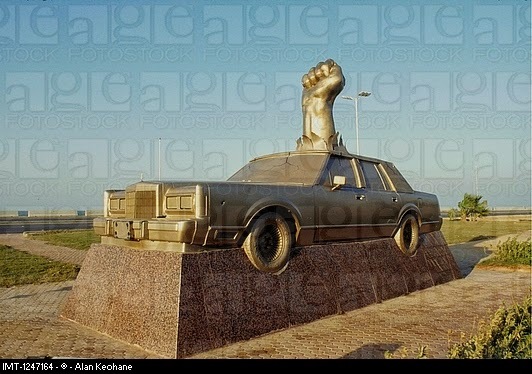 Apart from the gold Lincoln Continental with the really large gold fist punching up through the roof. I think it's a war memorial. Not really getting the symbolism. Dubai, United Arab Emirates, the UAE. The UAE could generously be described as flat, hot, and dusty. Sunny, though. Really sunny. All the time. Flying on Emirates Air (this year’s best airline in the world – this is true) is great. Not only do we have touch sensitive TV screens at every seat, and remote control units with a phone on the flip side, the cabin TV screen periodically shows us how far we are from Mecca, and what direction it is from us. So that we can orient ourselves in the right direction when it’s time for prayers. First class get their own VCR at every seat, with a choice of videos personally delivered by lovely air hostesses. I don’t want you to have to worry, so I’ll tell you now that my bag made it the rest of the trip with me. It would have been funnier if it had continued to follow me, meeting me briefly in airports as I pick it up from customs and carry up to check it in again, but not funnier enough for me to have been happy about it. Some fishermen on Lake Victoria from Uganda got tired of actually fishing, so they decided that it wold be lots easier to just throw poison in the water and scoop the dead fish up in nets. They sorta forgot that what is poison for the fish is poison for the fish-eaters, so after a few dozen people died from the fish, they had to ban eating any fish from the lake. Bad idea. We saw giraffes driving home from the airport in Nairobi. Well, giraffe heads. The rest of them was hidden below the trees. Actually, that first sentence was bad. 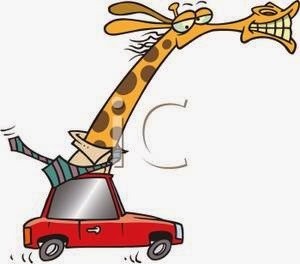 We did not see any giraffes driving home – it’s illegal for wild animals to drive in Kenya. The actual human drivers are wild enough. First, the roads have apparently been bombed. Your basic path weaves through the potholes like a drunken sailor, and that’s if the roads used to be paved at some point in the past. Most of the roads are dirt, with ruts big enough to swallow aircraft carriers. Add to that two opposing lanes of traffic, and the whole enterprise gets pretty exciting as everybody weaves and bobs through the potholes and ruts and cars coming from the other direction and donkey carts, plus jaywalkers and the occasional elephant. OK, I lied about the elephant. Plus there are these vans called “mutations” or “matatus” or something which are driven by crazy people who jam as many people into the van as possible and then drive like suicide bombers. I think they kill a lot of people on the roads in Kenya. We did get to go to the Nairobi Game Park, which is sorta like a city park only it’s 625 square miles of stunning African plains with animals that can stomp or eat you, instead of squirrels and pigeons. We were hoping to see lions, so don’t ask me why we were sitting on the roof of the jeep. We maybe saw a cheetah. We did see elands and impalas and cape buffalo and a rhinoceros and baboons and giraffes (more than just heads), but no zebras, and hartebeests and cool birds that I don’t know what they’re called. 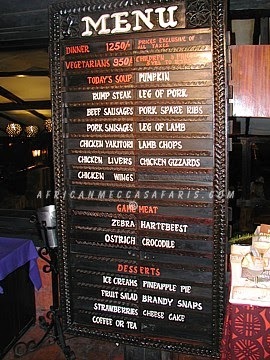 Then we went to a restaurant called the Carnivore where guys walked around with big haunches of meat on Maasai warrior swords hacking off chunks of zebra, eland, waterbuck (I don’t know what that is either, but it tasted good) and other, more pedestrian meat like pig and stuff. 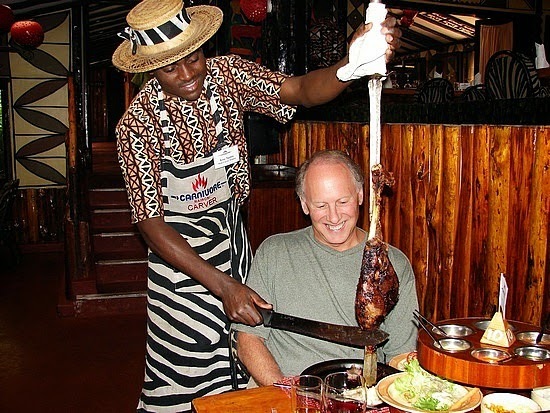 So the whole experience was like one of those restaurants where you choose your own lobster, only we were choosing our own zebra. If we’d seen any. In a final irony, as I stood in line at Entebbe International Airport, waiting to check in to board a gleaming British Airways 747, all the airport power went out and the computers went down in the terminal, forcing the agents to check us in laboriously by hand. I flew home Entebbe, Nairobi, London Gatwick, London Heathrow, Newark, Denver, and Colorado Springs, another 32-hour epic. Africa had one final chance to let me know who was in charge – the power outage in Entebbe led to a luggage miscount, so they had to off-load all the bags onto the tarmac in Nairobi, and off-load all of us passengers so that we could identify our bags. Did I mention that my bag didn’t make it to the USA? I have now lost my underwear on four continents. A lot has been written about the loss of common sense in America, particularly by those on the right. On the surface, the observations seem reasonable. Courts make seemingly outrageous civil settlements, or set vicious criminals free on technicalities. Entrenched bureaucracies enforce laws blindly without regard for individual variations or needs. Common sense says that the more guns a society has, the more violent it is likely to be. Guns do not make a people violent. But they do give a violent people the ability to kill quickly, easily, thoughtlessly, like a mindless bureaucracy might do. Common sense might prompt us to look at other countries with many fewer guns, and much, much lower rates of violent crime. Common sense will tell us that if there is a death penalty, innocent people will be put to death for crimes they did not commit, along with the guilty who are executed for the crimes they did commit. Common sense will suggest that if the death penalty is the one punishment that cannot be fixed after the fact, then the death penalty should not be an option for punishment. 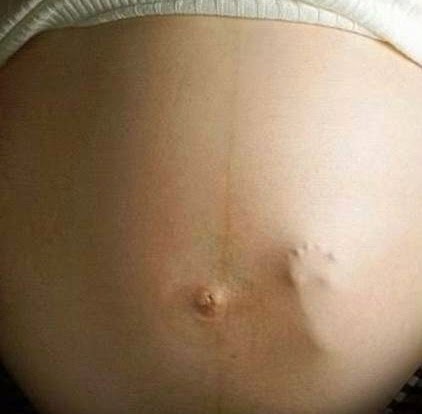 Common sense will tell us that just because we assume that a fetus is not human, because it is more convenient for us to make that assumption, that does not make a fetus not a human. Our comfort levels do not redefine reality for us. Common sense will demonstrate that the reason we have laws which restrict the rights of good people and businesses is because bad people and businesses have forced us to write those laws. Common sense will look at history to realize that capitalism will not work without the checks and balances found in a good dose of socialism, and vice versa. A healthy society will have the vigor of capitalism, and the wisdom to protect its workers via socialism. Common sense will show that the way to prevent poor people from illegally entering this country looking for better jobs for better pay is to help the countries from whence these people come to provide better jobs for better pay. That may entail some willing sacrifice on our part, else they will continue to come, and the jobs they seek will flee our own borders into lands with cheaper labor. 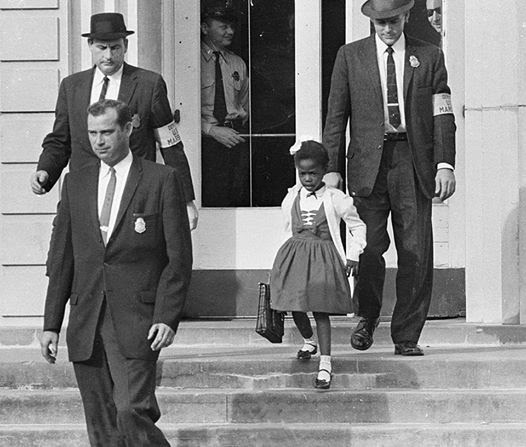 Common sense says that if a people suffers racial discrimination for generations, the solutions will be complex, and will require sacrifice by those who descend from the discriminators. Common sense says that the poor are poor for complicated reasons, not only or even primarily laziness and greed. There are many lazy, greedy rich people. 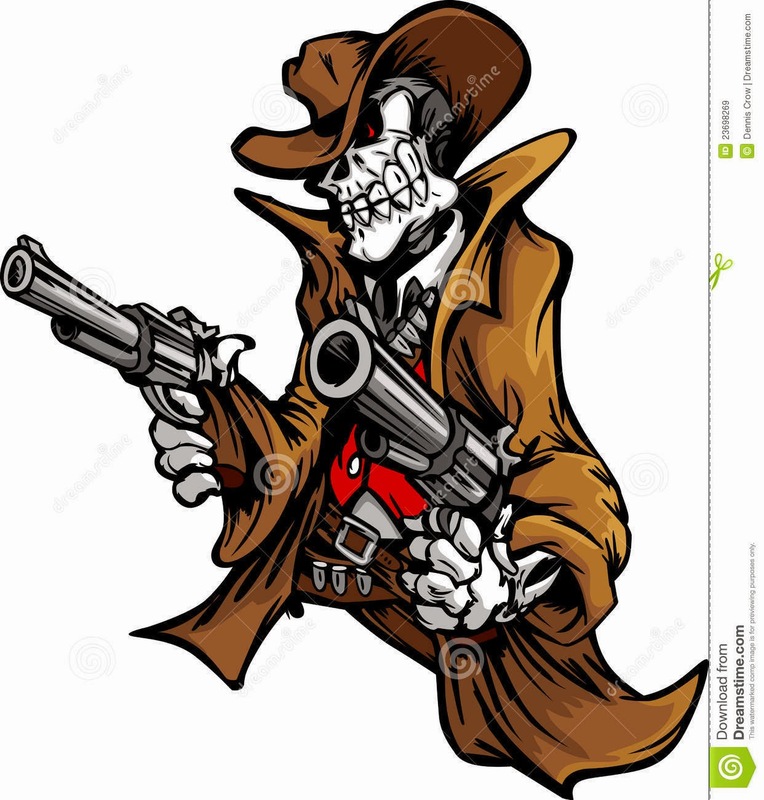 Common sense says that demonizing those least able to defend themselves is demonic. Common sense says that if we do not help the poor kids while they are kids, we will have yet another generation of poor adults having poor kids, and that many of us could find ourselves, through a careless decision or an indifferent society, living poor and homeless. Common sense says that we need to protect both businesses and the environment from each other. Common sense tells us that most criminals will eventually be released, and that we need to prepare them to re-enter society, to be able to work and earn a living, to be forgiven with wisdom. A subculture of angry, alienated people will make enemies of the rest of us far more successfully than we will make enemies of them. Common sense tells us all that living in a country which provides for us will have a cost, and that we each should expect to pay what is required. It also tells us that some will not be able to pay, and that, because we are a good people, we should be willing to help. Common sense tells us that when we are at our best, we desire a society with no poor, no homeless, no victims of violence or discrimination, a place where the innocent do not suffer and the guilty are both punished and offered rehabilitation, a land of communities where people care for each other regardless of differences. We desire a place where no babies are aborted, no one is addicted, no one beats another, and all are given an equal chance to succeed. Common sense tells us we will never have such a society. Thus, we must not only care for ourselves, but for each other, and we must both stand firm for what we believe, and be willing to compromise. Above all, we must try to love one another, as trite and simplistic as it sounds. Why Religious People should love Big Bang. Not the show. The Bang. Let's just start with the answer. 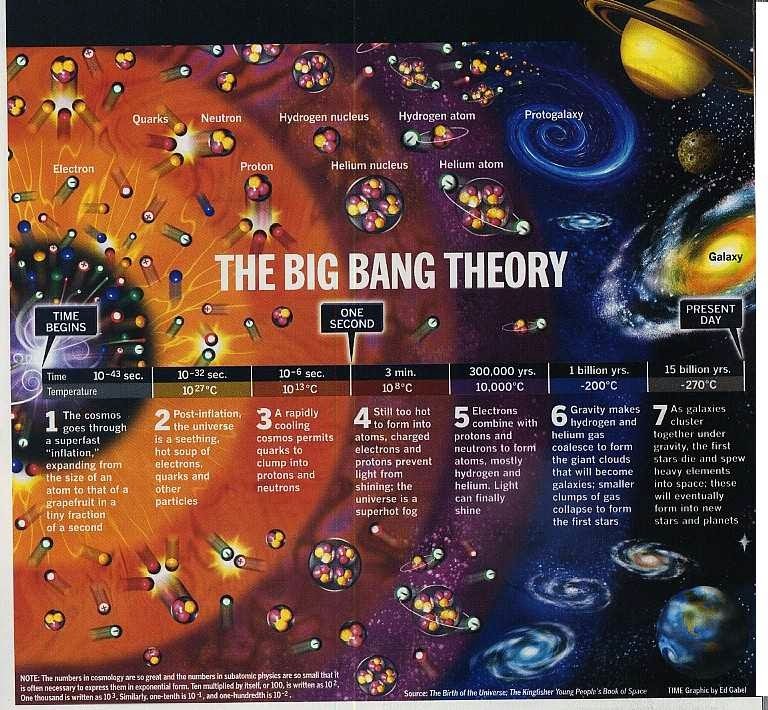 You should love Big Bang because the discovery of Big Bang was the most amazing, stunning, unbelievable, extraordinary, mind-boggling, gobsmacking, paradigm-shattering, science-altering event in the history of human thought, and it brought the discussion over the existence of God back onto the table. You should love Big Bang because Albert Einstein rejected it out of hand as ridiculous, and messed up a perfectly good equation trying to force the universe to, well, not have a Big Bang right there at the beginning. Not only did Einstein reject it, most if not all scientists rejected it. Einstein rejected it even though his own personal General Theory of Relativity predicted it a full decade before there was any evidence that it might be true. This was a big surprise to Albert. He didn't put a Big Bang in there, so it was quite a shock when it popped out. It was really shocking to him when all the evidence started to line up in support of Big Bang. He had to go back and fix his equation, which made it beautiful once again. You should love Big Bang because British astronomer Fred Hoyle rejected it to the end of his life in 2001, saying in 1982 that "the passionate frenzy with which the Big Bang cosmology is clutched to the corporate scientific bosom evidently arises from a deep-rooted attachment to the first chapter of Genesis, religious fundamentalism at its strongest." He rejected it because it sounded too much like religion. And many of us reject it because it sounds too much like science. You especially should love Big Bang because if you don't, if you try to argue for a young earth and universe that are only 6000 years old, not only do skeptics and atheists dismiss that argument out of hand, they think you're an idiot, and you've lost any chance you might have had to talk about the real and serious issues of faith. Here's the thing - I'm guessing that most Protestant believers reject Big Bang in large part for the same reason that most science-minded skeptics accept it without question. That reason is pretty simple - neither group has the slightest understanding of what Big Bang really is. So it might be useful to explain it. 1-2-3 go. We all understand the universe to be the way that Isaac Newton's equations describe it for us. It's logical, reasonable. It makes sense. It is common-sensical. It's a WYSIWYG universe - what you see is what you get. When you look at it, that's the way it is. Scientists had decided that since the universe looked really big and really old, that it must in fact be infinitely big and infinitely old. It had always been there, static, stationary, unchanging. That's what it looked like. That must be the way it is, was, and had been. Turns out not to be that way. At all. In 1905 and 1915, Einstein turned our understanding of the universe upside down and inside out. He even turned his own understanding of the universe on its head. In 1905 in the Special Theory of Relativity, he discovered that time is not a constant. It's a variable. It changes as you get closer to the speed of light. The closer you get, the more it changes. Time has a speed, and its speed slows down as you speed up. The faster you go, the slower time passes. And if you could reach the speed of light, time would stop altogether. Actually, it's more accurate to say that at the speed of light, things that happen aren't separated by time anymore. Everything happens at once. All of the history of the universe happens at the same instant. Your birth, your life, your death, everything happens at the same time. What's more, he discovered that space and time aren't separate - they're woven together. The universe is made of space-time. And at the speed of light, space flattens to two dimensions. So not only does everything happen at once, it all happens at the same place. Sort of. I have this physics t-shirt that reads: Time exists so that everything doesn't happen at once. Space exists so that it all doesn't happen to you. In 1916 in the General Theory of Relativity, he revealed his discovery that space-time is flexible, bendable, warpable. And what bends and warps space-time is matter. Anything made of matter bends and warps space-time. What we call that is Gravity. Gravity is the bending of space-time by anything made of matter. The sun, the earth, the moon. You. Me. Matter of any size and shape. We all bend space-time. Among other things, this means that the closer you are to center of the earth, for example, the slower time passes. Time passes more slowly at your toes than at your nose. Among other other things, this means that the more matter you have squished into a very small place, the greater the warping of space-time. Space-time can warp so much that it bends completely around itself into a sphere and cuts off the universe. We call that a Black Hole. Now it gets interesting. Like, if it wasn't already. A guy named Georges Lemaître, a Belgian physicist who was also a priest, worked through the math of the General Theory in 1927 and discovered something that Albert himself didn't put there, didn't expect, and didn't want. Lemaître found out that the General Theory predicts that the universe will be expanding as you go forward in time. The universe expands. It doesn't stay the same size. It's not static, stationary, or unchanging. And if you turn around and look backwards in time, then the universe is getting smaller. It's contracting. And it can only contract just … so … far … before it … disappears altogether. 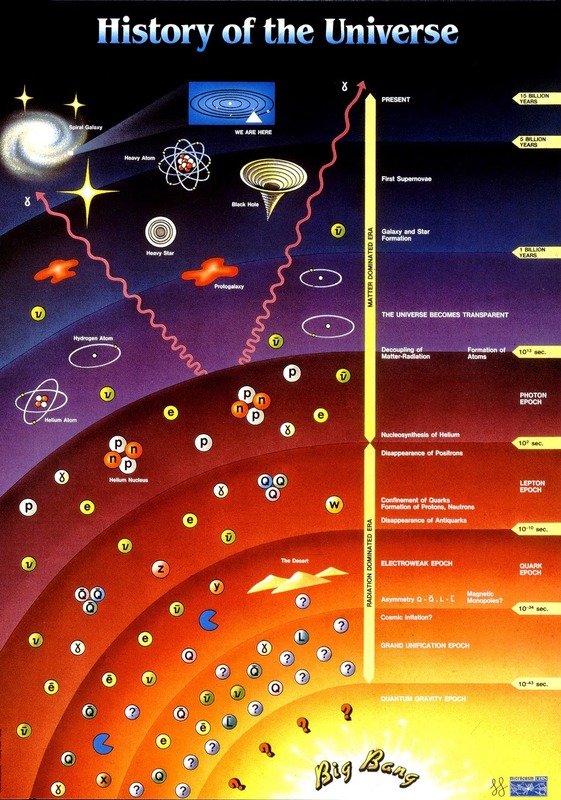 Fred Hoyle, in trying to explain this on the radio in 1949, called it a "Big Bang." The name stuck. He didn't like it. Nobody else did at first, either. Not the name. The name was fine. The concept. The universe having a starting point. It was just something the General Theory predicted. There was no evidence for it. Without evidence, it's not science yet, neither true nor false. In 1929, Edwin Hubble revealed his discovery that in looking at the light of the distant galaxies in the universe, he found that the universe was in fact expanding. It was getting bigger. Lemaître was right, Einstein was wrong. There was a starting point, a place where it all began. Here's what we tend to think. We tend to think that there was a vast emptiness, dark, an endless vacuum of nothingness, no planets, no stars, no galaxies, no Walmarts, no Starbucks. Nothing but nothing. That's wrong. It implies that nothing is, in fact, something. That something would be space-time. But as you go backwards in time, the universe contracts. Space-time contracts. Space-time itself gets smaller and smaller until it just … disappears altogether. Which means this: Big Bang was that moment when space and time came into existence. Before Big Bang, there was no … before. No space. No time. No nothing. There was no there there for anything to be there in, no when for anything to be then in. Then, in a tiny tiny fraction of a second, the rate of expansion perfect to one part in ten to the sixtieth, the universe blew itself into existence. In a moment of a moment of a moment, what we call the Singularity became a universe-sized universe, a cosmos-sized cosmos, the whole process taking far less than one second. Science thinks that one part of the Big Bang was when the universe expanded from a nano-sized square to 250 million light years across in .000000000000000000000000000000000001 second. Everything … came from … nothing. In, like, no time. Space. Time. Energy. Matter. The laws of physics themselves. Everything and the potential for everything else came from … nothing. I told this to a classroom full of students in Switzerland a few years ago. There was a long, long, quiet pause when nobody breathed and everyone tried to absorb it. They were mostly skeptics, atheists who believed that science has disproved the existence of God, that Big Bang was central to showing that God does not exist. Then I told them about the Bang. Quiet. And then someone in the back of the room, some atheist, skeptical kid, said one word. He said, "God." That's why you should love the Big Bang.